Huge collection of videos to help you look your best. New videos added regularly. 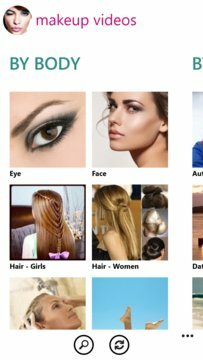 You can also search to find and see videos for the makeup style you are looking for. You will find makeup videos for eye, hair, skin care, lips, legs, tummy, spring, summer, autumn, winter, beach, back to school & much more. If you would want us to include any other category, please let us know. You can use the "send feedback" option from the app menu. Experts: Andreas Choice, Beauty Crush, Bethany Mota, Ingrid Nilsen, Lisa Eldridge, Makeup Geek, Michelle Phan, Shaaanxo, Tanya Burr & Wayne Goss.